Got your tinfoil hat on? Good. 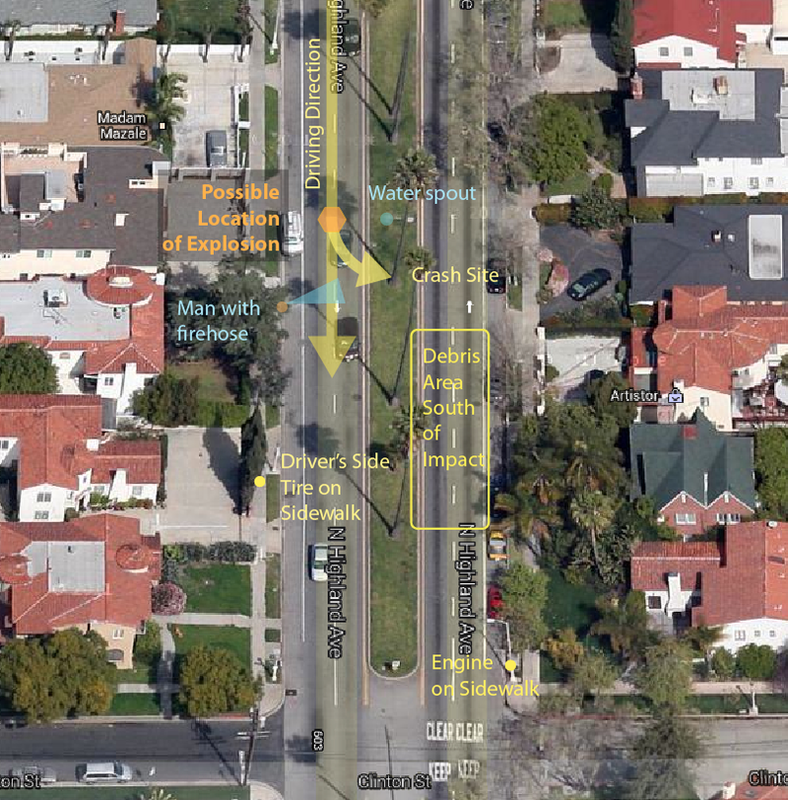 A new video by a DIY detective contains detailed analysis of the scene of Michael Hastings' fatal "accident" based on the Loudlabs YouTube video and Google Maps. After looking at the original Loudlabs video more closely, now even I'm convinced the locations of the debris and the video images of the car strongly suggest that Hastings was killed by a car bomb that went off just before the car came to a rest at the palm tree. Here are the top reasons why. You can confirm these yourself by studying the Loudlabs video and Google Maps. 1) The location of the driver's side tire is southwest of the crash site. Possible explanation: The bomb caused the driver's side tire to break loose while Hastings' car was still headed south. The tire continued to roll south down the street, roughly parallel to the direction in which the vehicle was originally traveling. The wheel rolled up on the sidewalk where it might have hit the short brick wall seen in the video before falling sideways and coming to a rest. 2) When Hastings' car came to a rest at the palm tree, it was facing almost due east, not south. Further, the location of the driver's side tire is inconsistent with damage that would be expected if the car simply hit the tree, because the tire would have rolled to the east of the tree. Possible explanation: When the bomb exploded, the driver's side wheel fell off and continued rolling south while the car tilted forward toward the driver's side, causing the car to lean automatically to the left and turn into the median. 3) The location of the engine and transmission is 180 feet (60 yards) southeast of the crash site. The transmission could not have landed this far south of the crash site if it were simply ejected upon impact, which was in an easterly direction. Possible explanation: The bomb was located under the transmission and engine, which forced the transmission up into the air and slightly eastward, while the south-directed momentum from the moving car sent the transmission 60 yards southeast of the crash site. The location of the transmission on the sidewalk, rather than in the street, further supports the idea that the transmission became airborne. It is unlikely that the transmission merely skidded along the street to its final resting place, because it would have had to jump up the curb (~6 inches) onto the sidewalk. 4) The location of the debris field is also southeast of the crash site. (Note the location of the debris relative to the three (tall, short, and tall) palm trees south of the crash site.) Again, this is consistent with the story behind the engine's trajectory. If the debris were a result of the impact of the car against the tree, they should have landed east of the crash, not far south of it. 6) From the location of the water spout in the center of the median, you can draw a 90° angle from crash site to the road and find the point at which the car likely fell to the ground on the driver's side wheel area and began to lean left into the median. Also, recall that one of the witnesses observed the car bouncing up and down before it hit the tree, which is also consistent with a bomb underneath the vehicle while it was still in the road. Possible explanation: If the explosion occurred near the water spout, the downward force of the blast could have shaken loose underground water pipes that appear to be located near the water boxes seen at the level of the grass on the median. This helps to constrain the possible location of the explosion and supports the theory that the explosion occurred a short distance north of the crash site. Why was Michael Hastings in contact with Wikileaks just hours before he died? Was Michael Hastings working on something involving Edward Snowden? Did Hastings receive NSA data from Snowden? Was he preparing to go "off the radar" because he felt threatened or because his emails and calls were being traced by the FBI and NSA? Could a possible connection with Edward Snowden be the reason why the LAPD is keeping mum on their investigation? Why aren't Michael Hastings' friends and associates, many of whom are journalists, coming forward? Are they afraid? Or have they been told to keep quiet and stay under the radar? Update: Here's a follow up interview from The Young Turks with the Latino man who witnessed Hastings' car as it was driving down the street before and during the crash. He says that he saw sparks coming from the bottom of the car before it hit the tree and saw the car "fish-tail" and turn into the tree (as opposed to hitting the tree and then spinning around it). Unfortunately, embedding has been disabled, so you have to go to YouTube to see the video. Update: San Diego Channel 6 News has a new investigative report that questions such issues as the intense fire, the location of the transmission, and why both the LA police and fire departments have been told they can't speak to the media about the case despite having ruled almost immediately after the crash that no foul play was involved. While few new details are revealed in the report, it's clear that even mainstream media outlets like San Diego 6 News are not entirely satisfied with the LAPD's official statements about the cause of the crash or the pace of the investigation.